Lady, between the bike and the vinyl couch, you are one dedicated scrubber! I'm impressed! You are so sweet with your girls. I'm sure they'll grow up and know they had an amazing childhood and that their parents were a big part of that magic. You'll have this post in the future. Love your bicycle built for two! i remember riding a tandem with my dad when we were on vacation at the north sea. i was probably younger than hope now... so she might remember it too when she is older. i remember it like it was a week or so ago. it was a bit hard for my to reach the pedals as i was a bit too small so i just putting my feet up and didn't pedal at all and let my dad to all the work. i really thought he hasn't noticed it at all. 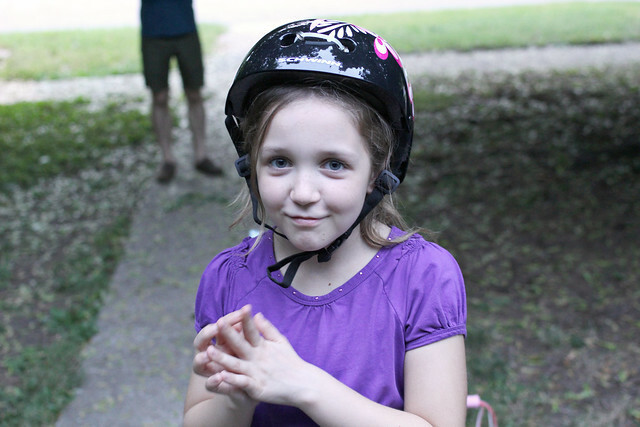 i felt so smart and sneaky and giggled a lot in the back of the tandem. he told me when we talked about it recently that it was the cutest, letting me think he didn't know. You are right! I actually don't own one (what?!) but have found the one I'm ordering! Thats such a sweet thing to hope. I think it will be strange, her being able to grow up and back track through your blog, but probably great. So sweet! You have such special family moments! I think you should name the bike Tammy. It looks so great Katie! Aw, I hope she remembers those little moments as well. You two always seem to have the sweetest moments. "Uh...I hope so." hehe that's so sweet. I get so sentimental about everything lately! I remember being very small and watching my dad video tape our family all around a bonfire by the lake and I told him to wait until something interesting happens and not to waste film on this boring stuff. He looked at me and said, "Shelley, some day you'll look back and realize these 'boring' moments are actually the biggest moments." I will never forget that! Aw, I love that so much! Nice work! It actually does look almost new with that shine on it! 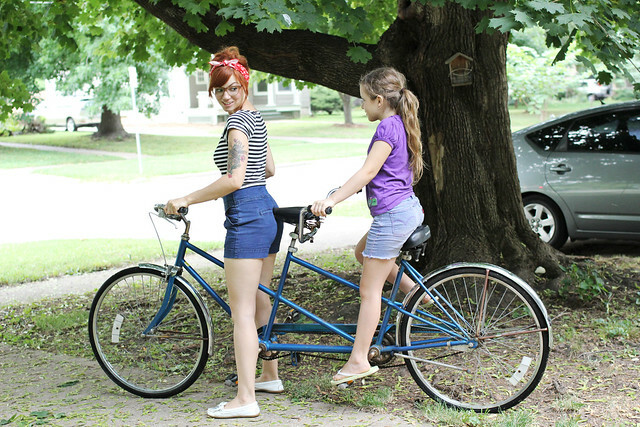 How about naming the tandem Daisy after that old old song about a bicycle built for two! 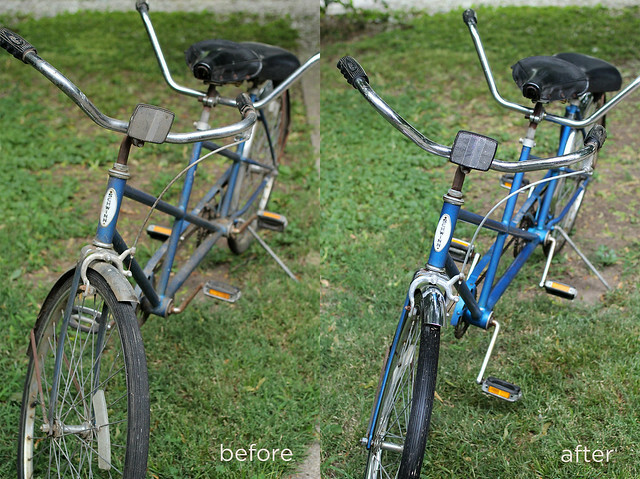 You did a great job, the tandem is now sparkling! Good job! It looks great!!! It looks great! Those old Schwinns clean up nicely. My husband and I have matching 1974, Flamboyant Lime, Schwinn Suburbans that we happened across at different times, but they're a perfect pair. One was really shabby when we bought it, but with lots of love it looks fabulous now. 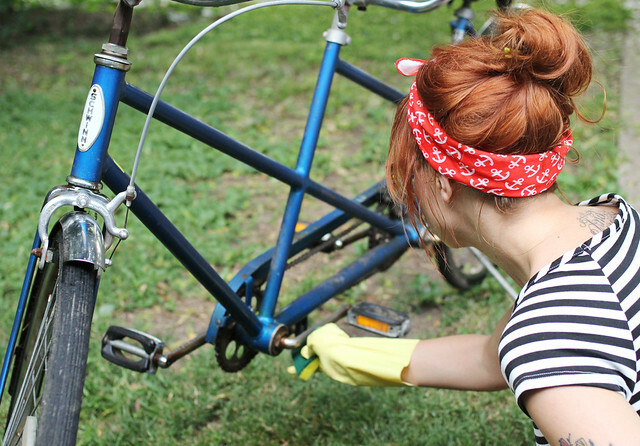 Katie, if you put WD-40 on a soft rag and wipe your tandem down with it, it will help to keep the rust from building up again. :) Awesome bike. 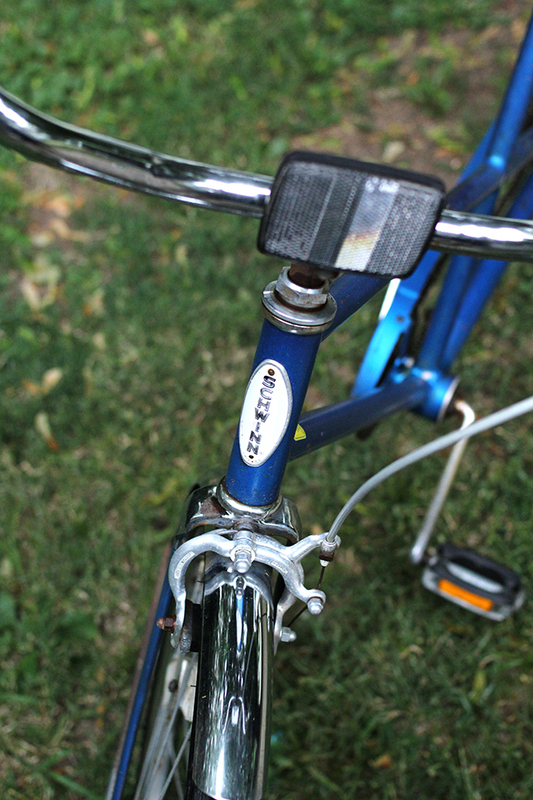 I have an old Schwinn that I got when I was about 6. It was my very first bike and the only one I ever had growing up. It is in need of a major overhaul. I will one day do this. I believe it is possible from the mid 50's. I love it. Ooooh, thank you so much for the tip! I will definitely be doing this! My friend and I just bout the same bike of craigslist! We used Brillo Pads on all the rusted silver and used CLR on the blue. Now I wish I would have taken before and after pics because yours look amazing! Oh the bike! She's glowing! Well done, and I like that she doesn't look totally brand new. Part of the charm is the vintage feel. You are just about the raddest chick ever!!! Such an inspiration in all ways possible!!! Looks like all that effort paid off - it is looking really great! Such a beautiful bicycle - well worth the effort! Bicycles are a huge part of our home life...my husband even had his BMX at our wedding! Bicycles make the best memories! Love your anchor bandana! The bike looks fairly fantastic as well! this almost made me tear up: "Hope, do you think you'll remember these nights when you're all grown up? The breeze, the sounds, the smells?" ...how i long for the days like this of my childhood! I think the coolest part of this post is, other than maybe the time you're spending with your child, the fact that you have a tandem bike! Making memories like these is priceless. Thanks for sharing this with all of us. WOW! That is an amazing improvement with the before and after shots. I hope your daughter remembers things like this ride too. I'm sure she will. You should name the bike Winny! Since it's a Schwinn... Get it? Wow, it looks so much more amazing in the after picture. 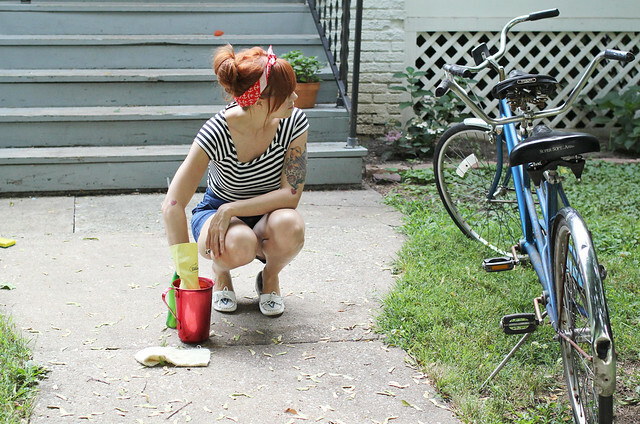 I don't know how you always look so stylish even when cleaning! If you are trying to get rid of rust on the chromed areas (handlebar etc) I've found that using some metal polish and wire wool then wiping it down with a cloth can take it straight off if it is surface rust. I have just started a project to do up a bicycle and started a blog to record it, but it requires rather more work than a clean up sadly! Lots of replacing of parts/ repainting... But to be able to ride a pretty bicycle I am sure it will be worth it. Ah your bike is looking great!! Where did you find it?